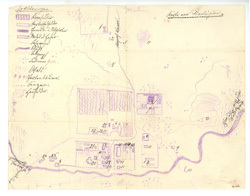 Description: Map of Darlington, Oklahoma. Although it says "H. Voth" down in the corner, the handwriting does not look like H. R. Voth's. Also, we do not have a key that indicates the meaning of the numbers. Found in MLA vertical file.